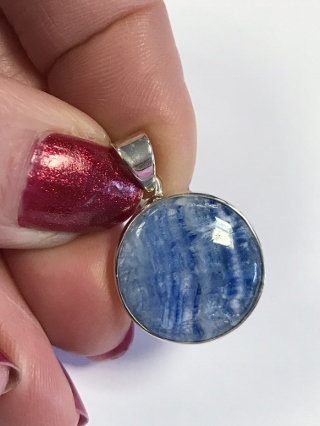 A delightful Scheelite pendant, set in 925 Sterling Silver. Scheelite is a valued ore of Tungsten that is highly priced in its yellow to orange crystal form. Here we have it included in a pretty blue banded Kyanite. Scheelite is a stone of balance, aiding alignment of the chakras, enhancing all forms of communication and stimulating the Yin/female energy to counteract an excess of Yang when it is destructive or unproductive. It can be used to treat lower back problems and improve circulation in the legs and feet.